Defumada translates roughly to "cured" in English—and in fact, this beer gains its unique flavor profile by a process similar to curing of meats. While relatively rare among the spectrum of beers out there, there is a style of beer in which 'green' (not yet fully dried) barley malt is roasted over an open flame, typically fueled by beechwood. The result is a roasted barley that is heavily imbued with a distinct smoky quality that is then passed on to the beer during the brewing process. The most striking and traditional examples of this style of beer, known as Rauchbier ("rauch" means "smoke" in German), are brewed in Bamberg, Germany. So, why would a Brazilian microbrewery branch out into such a rare style so early in their career? Well, we think it's to prove a couple points: they're not afraid to take risks, and they're proud of their brewing prowess. Bottom line—these folks got the skills to pay the bills… While this version is not nearly as heavily 'smoked' as examples from Bamberg, it's done well (rather than 'well done'), with a healthy respect for tradition. From start to finish, expect notes of smoked beechwood, with notes of apple skins, white grapes, moderately bitter hops and multigrain bread all present as well. Tangy hops work nicely against the smoky notes, with a nice flavor volley between the sweet and bitter notes. Great with smoked gouda and sausages, and it instantly elevates a simple Slim Jim to a gourmet treat. We suggest sipping in front of a nighttime fire, indoors or out, as the welcome fall breeze blows in. 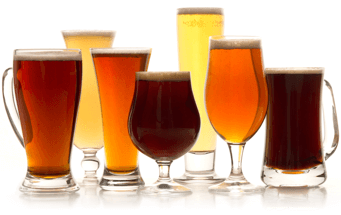 Thanks to the microbrew renaissance of the 80s & 90s Americans have literally thousands of choices—of Pale Ales alone! For "real beer" fans, life, as they say, is good. The craft brewer spirit has spread outward from the US too—which is not to say we created it; craft brewers have been at it in parts of Europe since at least the 11th century. But, some efforts in the US have actually led to the resurrection of styles of beer that were nearly lost to history (porter is one example that comes to mind). There's a definite contagiousness surrounding the enjoyment of microbrewed beer, and in fact, it's not limited to the US, it's spreading throughout the continent. But, what about our southerly neighbors? Well, truth be told, the craze has yet to really take hold. While there are some true brew craftspeople in South America, pallid pilsner beers (mainly cheap, adjunct versions) are king. Hey, let's not kid ourselves—the same is (sadly) still true in the states. But thanks to a handful of truly dedicated brewers, better beer is getting noticed down there. The folks at Cervejaria Sudbrack have been brewing quality ales & lagers in accordance with traditions of European masters. Their true-to-style beers so closely emulate the greats of Britain, Belgium and German beers, that in a blind taste test, you'd be shocked to discover they came out of Brazil. But, interestingly, the region of Blumenau, in which they make their home, is no stranger to European tradition. Beginning with the Portuguese Azors, who colonized the land many centuries ago, European traditions were brought to this region of South America. These early settlers certainly left their mark (the national language of Brazil is still Portuguese). Immigrants from the heartland of beer-culture, Germany, also took up residence here in the 1800s when they colonized the region. They too left their mark; Blumenau, in the province of Santa Catarina, Brazil, where the brewery is located, is home to the world's second largest Oktoberfest (outside of Munich that is). Despite the beer-loving roots firmly planted here some 200 years ago, local craft-brewed beer has been difficult to find. As Cervejaria Sudbrack cofounder Juliano Mendes puts it, "[Brazil is] twenty-five years behind where the United States is today. The US has already created a relatively large group of interested and educated consumers of craft beer. In Brazil, we are only the beginning of the 'craft beer revolution and we have a lot of work in front of us in order to create this type of 'craft beer culture'". To hammer home the point, consider this: today, craft brewers in Brazil hold about 0.05% of the market (the figure hovers just above 4% in the US, an 8-fold difference). While studying in Boston, and taking inspiration from the craft brewed beers made by Samuel Adams (Boston Beer Company), Juliano and his brother decided that they'd return to Brazil and start a brewery. In 2002, Juliano, his brother, father and a fellow associate founded Cervejaria Sudbrack. 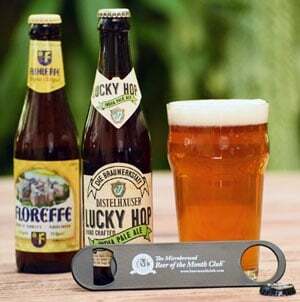 Aided in no small part by a brewing engineer who was educated in Berlin, and their brewmaster who studied at the legendary Brauerei Weihenstephan, the brewery has developed full-bodied, character-loaded brews that are quickly garnering critical acclaim. While reviewing South American beers about a year and a half ago, we had the chance to evaluate quite a few made by Juliano Mendes & company. We've still got our eyes on these folks, as their beers are really world class in a country where top-notch, craft-brewed beers are difficult to come by. We were floored by how well made their beers are, not to mention how true to style their Belgian- and German-inspired beers are. For more information about the brewery, visit www.eisenbahn.com.br. Interestingly, the brewery has its own theme song, which you can listen to at: www.eisenbahn.com.br/mp3/01_Hino_Eisenbahn.mp3. We spent hours trying to figure out a way to get the tune to play as you opened your monthly shipment, but we couldn't get our finance department to share our enthusiasm—so, pop open one of these beers, pour into the appropriate glassware, load up that theme song and crank up those computer speakers!